The cycling world saw a lot of Egan Bernal in July as he played a crucial role in teammate Geraint Thomas’ Tour de France victory. But it might be a while before the young Colombian phenomenon from Team Sky is back at the front of a race. In Saturday’s one-day Clasica San Sebastian, Bernal was caught in a bad crash with 20km to go when a rider at the front of the pack accidentally crossed wheels with another. The crash took down a dozen racers; Bernal was the most seriously hurt. Bernal was put in a neck brace and evacuated to Donostia University Hospital, where Sarriegui met him and had a brief conversation before the staff put Bernal through a full-body CT scan. Bernal was bloody but alert, but Sarriegui said the young climber had no memory of the crash. That’s often a sign of brain trauma, and sure enough, tests showed Bernal had significant injuries. 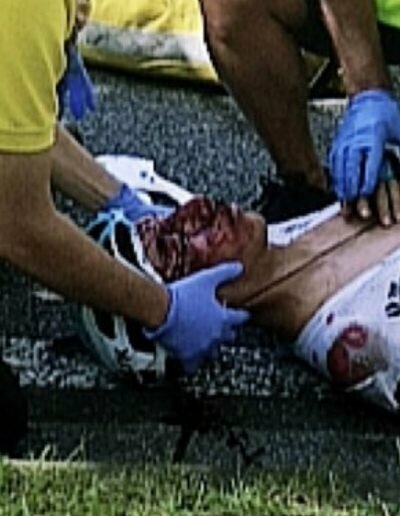 He had substantial damage to teeth in both jaws; there was a small nasal fracture; Bernal required stitches to put his upper lip back together; finally, scans showed a brain bleed, a kind of traumatic brain injury that occurs when a blood vessel in the brain breaks and causes localized bleeding. It can be life-threatening. 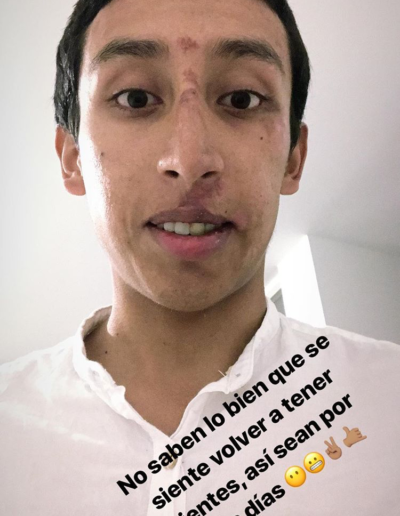 So it’s going to be a while before Bernal races a bike again. 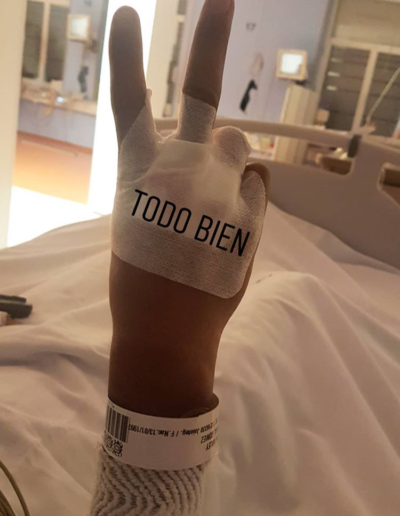 Despite that, the team is optimistic about his recovery timeline; both Sarriegui and Bernal’s coach, Xabier Artetxe, won’t even rule out a return to competition this year. The last major road races end in mid-October, which would be a remarkably fast recovery if it happens. It’s more likely he’ll return to competition in late January 2019 at the earliest. On Bernal’s side is his age: He’s just 21 and has a long career ahead of him, provided he takes the time to properly recover from his injuries. “We can’t compromise his future,” Artetxe says. It will be a difficult path. Bernal was released from the hospital on Monday and spent the rest of the week in Spain, much of it at Artetxe’s house. But he flew home to Colombia on Friday. “He’s got an extensive support network at home and will be happier there with family,” Sarriegui says. But Bernal will need a series of reconstructive dental surgeries to repair the damage to his face, and Sarriegui says that won’t even start for a few weeks as doctors wait for the swelling to subside. At the moment, they don’t even know the full extent of the damage. “Two teeth are completely gone, and he fractured more and quite likely some will be unsalvageable,” says Sarriegui, meaning Bernal will need bridgework and permanent implants. For the moment, he’s off the bike for three weeks minimum while doctors monitor the brain bleed. Then, says Artetxe, he can gradually return to riding, first just with light efforts inside on a stationary trainer, eventually returning to the road when he’s ready. Bernal’s form this summer was stunning — he was at the front on the hardest climbs of the Tour de France and finished 15th overall even in support of Thomas — and he will lose much of that. A 2016 study in the Journal of Sports Sciences that Artetxe co-authored followed 10 young elite cyclists around Bernal’s age during a break from training and found key measures of fitness such as maximal oxygen uptake, maximum sustainable power output and red blood cell count all decreased significantly over a five-week period of inactivity. But that’s not a concern for now, team officials say; there will be time to rebuild Bernal’s fitness. The immediate issue is healing the intracerebral bleeding and monitoring Bernal for symptoms such as headaches or changes to consciousness, like confusion. Then, the primary obstacle will be avoiding infection during the multiple dental surgeries he’ll need, which could take up to a year total and include structural and cosmetic reconstruction. Among the things Bernal and Sky will need to watch is proper nutrition, Sarriegui says. 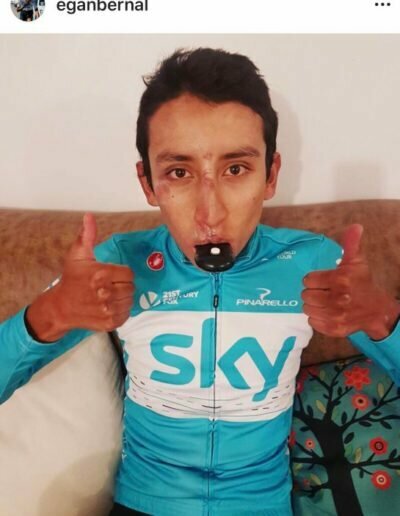 Despite the injuries, Bernal is already eating soft foods and should be able to progress to more solid foods over the next month or so. But as the slightly built Bernal eases back into training, he has to eat well and not lose weight, which will be a challenge with a more limited diet. “He needs to be fueling well with the right nutrition to ensure he doesn’t suffer from complications,” Sarriegui says. But Artetxe says that, in Bernal’s case, neither crash was caused by a deficit of handling skills or taking excessive risks. They were just bad luck. That should help him regain confidence. And after the other crash, at least, Bernal recovered more quickly than the team expected. Originally, Sky figured his first race back would be mid-May’s Tour of California. Instead, he returned to competition just a month after the crash, at the late-April Tour of Romandie, where he won a stage and finished second overall. Then he won two stages and the overall at California, and the team decided he was ready for his first three-week Grand Tour, the Tour de France.